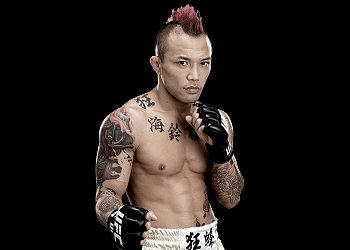 It’s not often a fighter on a three-fight skid is welcomed back to the UFC, especially one who’s 37 and has been out of action for exactly 33 months, but Norifumi ‘Kid’ Yamamoto (pictured) has pulled a rabbit out of his hat. On Wednesday, the UFC announced Yamamoto will face Roman Salazar at UFC 184. The February 28 show takes place inside Staples Center in Los Angeles, California. UFC president Dana White hasn’t been shy about sporting his “Kid” fanboy cap, so perhaps that’s why the company is giving the 13-year veteran another go. The Japanese star has lost all three of his fights under the UFC’s watch and hasn’t been seen since getting submitted by Vaughan Lee at UFC 144 in February 2012. Speaking of getting tapped out, Salazar lost to Mitch Gagnon in his UFC debut via rear-naked choke. The 26-year-old had won four straight before getting called up to the big show.